Why might you need LASEK? Whilst around 90% of laser eye treatments carried out today are LASIK, it might not always be the most suitable treatment for people wishing to have laser eye surgery. We aim to provide the most suitable solution for patients on an individual basis with treatments specifically tailored to their needs. ‘Photorefractive keratectomy’ or PRK was in fact the first type of laser eye surgery treatment and was pioneered in the 1980s. With PRK the epithelium (the thin outer layer of cells on the cornea) was gently removed by the surgeon and discarded. Then an excimer laser was used to reshape the exposed cornea. LASEK (laser epithelial keratomileusis) is a variation of PRK and was introduced in the late 1990s. The original method of LASEK differed from PRK in that the epithelium was not discarded. Instead the surgeon applied a solution of 20% alcohol to the epithelium, softening it so it could be gently pushed aside like a rug. The surgeon then corrected the vision with an excimer laser in the usual way and the epithelium was then gently folded back. Nowadays a lot of surgeons use alcohol but discard the LASEK epithelium anyway as there is some evidence that this is more comfortable for the patient. A special surgical instrument known as a trephine is used to mark out the exact diameter of the LASEK epithelium needed be to removed before applying the alcohol solution. Once the excimer has been used to change the shape of the patient’s cornea (and hence altering the focussing of the eye), a soft bandage contact lens is applied to protect the corneal surface which is removed around 4 or 5 days later, once the layer of epithelial cells has grown back. 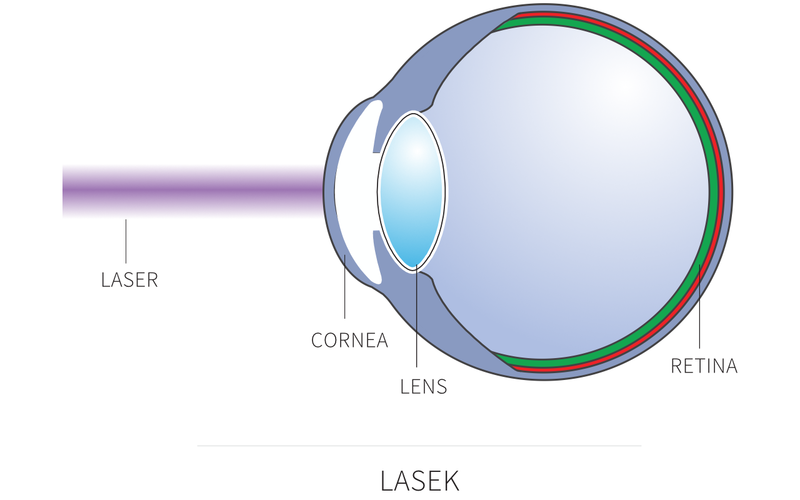 What are the differences between LASEK and LASIK? The main difference between LASEK and LASIK is that in LASEK there is no corneal flap while in LASIK a flap is created with the femtosecond laser at the first stage of the process. No flap is created with a LASEK procedure. We often explain the difference to patients by mentioning that the “E” in LASEK relates to Easier (to perform) on the Exterior or External surface of the cornea while the “I” in LASIK relates to Internal on the Inside / Interior (under the flap) and is more Invasive. Recovery from LASEK is quite a lot more uncomfortable however than LASIK and we always advise patients to take a full week off work after their LASEK surgery. It is also worth mentioning that visual results take longer to settle with LASEK and the quality of vision for the first few days is poor. This then improves considerably after the first week or two. LASEK is less invasive than LASIK so in theory leaves behind a stronger cornea. As such, patients involved in contact sports such as MMA (Mixed Martial Arts), rugby, boxing or similar, often opt for this laser eye surgery treatment since there is no corneal flap that could be damaged by direct contact. Anyone involved in professions such as the police or the military, where physical contact is a possibility, might also consider LASEK. In addition, people who have higher prescriptions and thinner than average corneas are also good candidates for LASEK since it is less invasive. 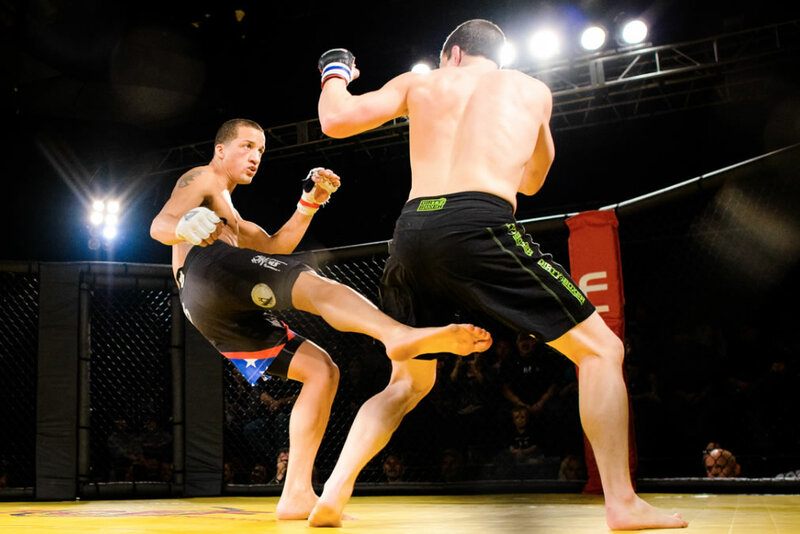 Those participating in contact sports such as MMA (Mixed Martial Arts) or boxing often choose LASEK as an alternative to LASIK. Whilst LASEK is not as common as the more popular LASIK treatment, there are clearly some advantages for certain types of patient. It is also a treatment that has been around for a long time and is a very straightforward procedure for the patient and the surgeon. All of our procedures are safe and are performed by one of the most experienced eye surgeons in the UK. We have many very positive experiences to share from happy patients who have undergone LASEK laser eye surgery.